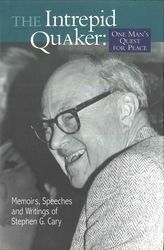 Steve Cary’s memoirs, speeches, and writings reveal leadership and philosophy that mirror the Quaker experience in education and peace work in the latter half of the twentieth century. Born in 1915 to a Philadelphia Quaker family, Stephen G. Cary led a life of spirit, courage, and action. A conscientious objector during World War II, Steve co-led the American Friends Service Committee effort to help rebuild Europe after the war, served the AFSC for six decades, and participated in civil disobedience throughout his life. He returned to his alma mater, Haverford College, as vice president and interim president and played a major role in shaping the College’s identity as a coeducational institution faithful to Quaker values. He died in 2002.